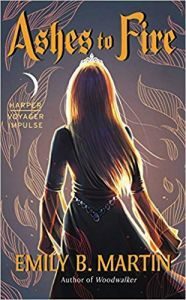 You are here: Home » MEDIA » Books » Ashes To Fire (Creatures Of Light book 2) by Emily B Martin (book review). Ashes To Fire (Creatures Of Light book 2) by Emily B Martin (book review). ‘Ashes To Fire’ is book two in the ‘Creatures Of Light’ series by Emily B Martin. This time we’re reading from Mona’s point of view as she goes on a diplomatic mission to meet with Celeno, the Alcoran King, and the reason why she and her brothers were trekking through the Silverwood after being exiled from the country in book one, ‘Woodwalker’. Unfortunately, the mission doesn’t go quite to plan. In fact, it’s even worse than Mona was anticipating. She is kidnapped along with the Queen of Alcoro and taken on a whistle stop tour of the Cyprien swamps. I have to admit that I found it tricky in the beginning to remember I’m now reading from the point of view of Mona. It took a while for me to find her voice as distinct from Mae, who voiced book one in the series. This might be because Mae was such an entertaining character to read from whereas Mona is quite a lot more reserved, especially at the beginning of the book. Mona is always thinking of how whatever she does will affect her people and her country. Her mother seems to have done a real job on her making her feel that she can’t even make a facial expression without it having some kind of dire consequences. As you can expect, given the background of the author, there is a lot of nature in this book from the swamps to sailing, to wild swimming. Lots of descriptions of the plants and animals that inhabit this new part of the world we’re seeing along with Mona for the first time. I really enjoyed all this description but I could see how some people might find that these sections drag a little. I also really loved the descriptions of the way of life of the Cyprien people and especially those living in the bayou/swamps. The way they are all under the thumb of the Alcorans but they all find ways to get around the laws and regulations imposed on them. Everyone Mona meets is a real character and I really hope that some of them appear in the last book in this trilogy. I’ve also been enjoying learning more about the different ways that the peoples of the different lands all worship the light but in different ways. Some see it in the glisten of the sun on waves, some in the glowing of a glow worm and others in the spark of fire. All very interesting and a great description of the different ways belief or lack of belief in some cases can manifest. Overall, I have to say that I enjoyed this book a great deal more than book one in the series. I’m not sure why that is maybe it’s the delicate love story in the pages or the changes we see come over Mona as the book unfolds? Who knows, but I can’t wait to read book three in this series to see if I love that one even more. « In An Absent Dream (The Wayward Children book 4) by Seanan McGuire (book review).